Great Review of Sinful Folk from the Historical Novel Reviews . England, 1377. Mear has been disguising herself as a man for almost ten years, raising her son and helping out at the smithy. Then her child and four other boys are killed in a mysterious fire. Mear sets out with other men from their remote village to take the five boys’ corpses to London to seek the king’s justice. Their trek is filled with hardships and revelations as Mear’s life-threatening secrets are unveiled and she finds bittersweet redemption at the end of the journey. This riveting, poetic story puts Mear and her companions through a series of brutal medieval adventures. It is a little difficult to suspend disbelief at times, because it seems impossible that the characters could survive the frigid winter and other perils that beset them. Life is relentlessly cruel, but halfway through the book the reader can start to guess who Mear’s lover was, and why it was necessary to hide herself and her child. It seems incredible that Mear’s true gender was never discovered during the village years, but that it is noticed so quickly by a relative stranger during one of their adventures. Still, this is a rich medieval tapestry of a story, and offers an intriguing fictional answer to one of English history’s unanswered questions. 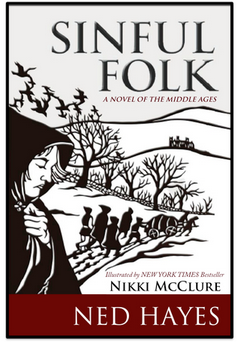 It is not a happy story, but it feels very authentic, as if the author had actually lived in the Middle Ages. Medieval fans should like this.